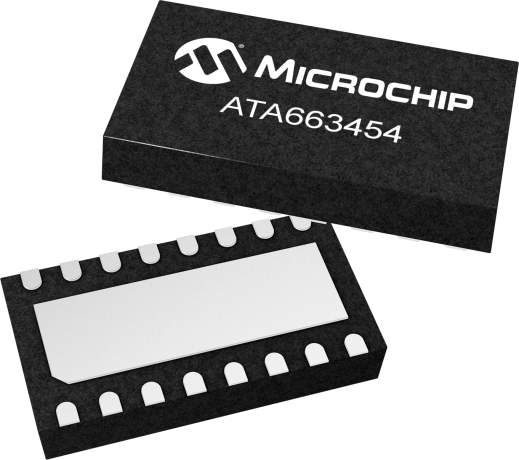 The Microchip's ATA663431/54 system basis chip is a fully integrated LIN transceiver, designed according to the LIN specification 2.0, 2.1, 2.2, 2.2A and SAEJ2602-2, with a low-drop voltage regulator with 3.3V/85mA (ATA663431) or 5V/85mA (ATA663454). Additional the device includes a Watchdog, a high-side switch and 2 high-voltage wake inputs: one positive edge sensitive, one negative edge sensitive. This combination makes it possible to develop simple but powerful slave nodes in LIN bus systems. Improved slope control at the LIN driver ensures secure data communication up to 20Kbaud. Sleep mode and silent mode guarantee minimized current consumption even in the case of a floating or a shorted LIN bus. The voltage regulator is a fully integrated low-drop regulator working down to a supply voltage of 2.3V with best-in-class current consumption in linear mode (2V<VVS<5V) with less than 170µA. This enables storing data within the MCU during system shutdown even in case of an unexpected power supply interruption. The device is available in DFN16 package with wettable flanks to enable optical soldering inspection. The footprint is compatible with the ATA663231/54 LIN system basis chip which enables customers to produce modules with/without watchdog by assembling the LIN SBC with watchdog (ATA663431/54) or the ATA663231/54 without watchdog. ATA663454A-V1.2 is an evaluation tool for a quick start with s 4th generation LIN SBC including LIN transceiver + low drop 5V/85mA voltage regulator + window watchdog + high-side switch enabling easy prototyping and testing.